This is another trade mark dish of mine. It’s full of flavour, vibrant colours, feta (who doesn’t love feta?) and looks great. Best of all, you most definitely will not taste the salt in this one. This recipe is an entrée, a snack and a main meal (well, it has become one now that I’m unwell). It can be eaten right away, stored in the fridge or frozen and eaten at anytime you feel like reheating it (directions on this below). Step 1: Preheat oven to 210°C and line two baking trays with baking paper. Take two sheets of puff pastry out of the freezer to defrost (I lie them on the counter next to each other – the heat of the room will do all the defrosting work). Step 2: In a medium bowl mix together the feta, spinach, lemon, salt and pepper. Note* you can add an egg in here as well if you want extra protein – I normally don’t unless I haven’t been getting enough protein lately. Step 3: Cut each sheet of puff pastry into four sections (or any other pattern that you would like). With a spoon (or any other implement) spread out the spinach and feta mixture diagonally along one of the new square section’s of pastry. Step 4: Fold the pastry with the mixture inside corner to corner tightly. Repeat with the remaining puff pastry squares. This should make 8. Step 5: Arrange the filled turnovers onto the baking trays. Step 6: Whisk an egg in a small bowl. Lightly brush all filled turnovers with the whisked egg. This will allow them to bronze nicely. Step 7: Place the filled turnovers into the oven for 18 – 25 minutes or until nicely golden. If you place the turnovers close together it will affect the sides of the turnovers from bronzing so I would recommend checking on them and moving them around to maximise the turnovers cooking evenly. The turnovers on the edge of the baking tray will cook the fastest. Step 8: Take out of oven. Allow to slightly cool and eat. The turnovers are quite healthy, as they have a good amount of iron through the spinach and salt in them through the feta and the added salt. I recommend eating them with tomato sauce for an added boost of flavour and salt – just made sure you don’t buy a sauce that is low in sodium! 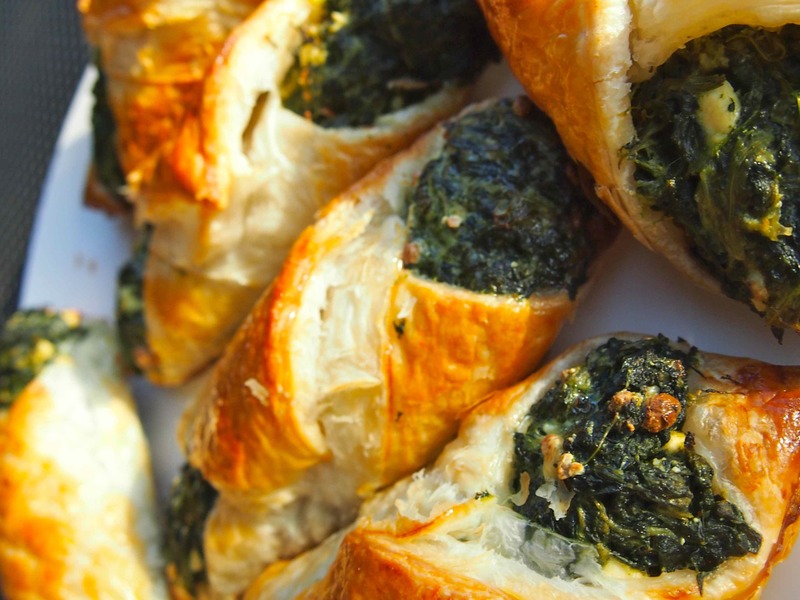 These spinach and feta turnovers have always been a big winner at family and friend functions. 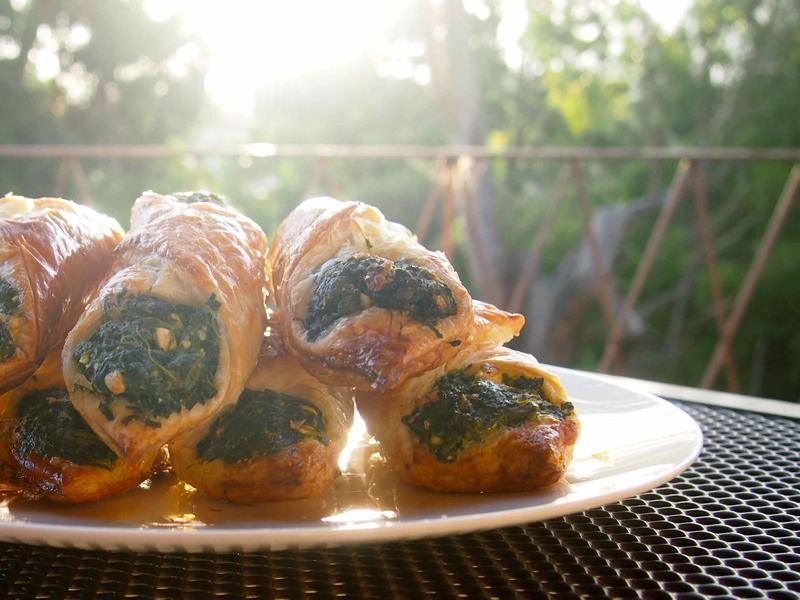 They are so easy to make at home and then reheat when you turn up at the function (definitely in the oven). As they are finger food size they do work well for functions but at the moment I have just been using them for easy at home meals. These turnovers are easy to freeze and reheat in either the microwave or the oven. My preference is to reheat them in the oven to maintain the crunch of the pastry – but I always defrost the turnovers in the microwave first. They still taste great when microwaved – just not as crunchy. I hope you enjoy them as much as I do! If you give them a try let me know how you go :). Thanks Natascha’s Palace! They really do burst with flavour – the lemon gives them a nice little kick. I love it! Definitely plan to try this one soon. The pictures help a lot! Thanks Holly! I’m glad that the photos are helpful :). Will only continue to be a ‘mystery’ until I make this delicious recipe over the weekend. So glad to have found your website! Thanks JoHanna. That is such a lovely comment! I hope you enjoy them this weekend 🙂 Let me know how you go with them! 🙂 I hope you do! Let me know what you think when you try them! Definitely will. Though that might be over the weekend. That’s great to hear. I hope this saves you some time when cooking :). It might also give it a bit more of a crunch compared to what your son is used to :). Let me know you think of the difference and if it is much of a time saver! Thanks Sarah! They’re so easy to make and full of flavour :). They fill you up pretty quickly! Can’t wait to try these! I CRAVE Greek Spanikopita and this looks like a great way to satisfy that fix at home :). Thanks! Fantastic! Let me know how you go when you do and if it satisfies that craving of yours :). Thank you! It is. It’s one of those recipes that i’ve made for years! Oh my, I may be cooking tomorrow. Your blog has inspired me with these delicious posts. They have succeeded in me now craving one of these! My family are going to thank you! 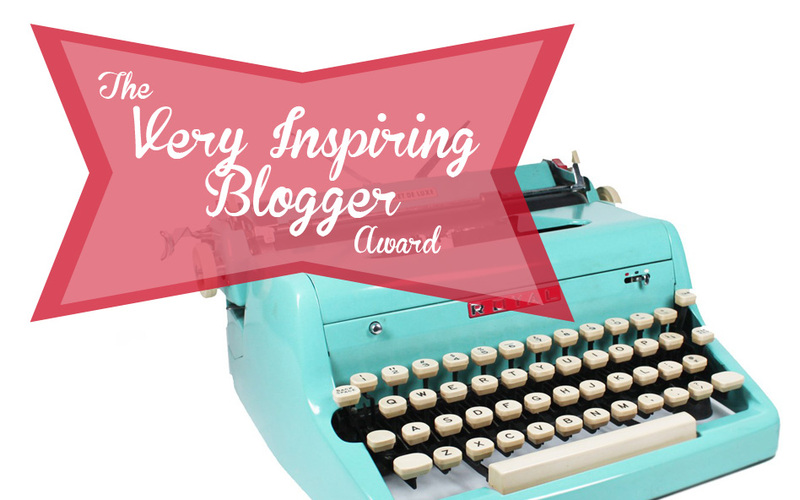 I’m so glad I have inspired you into a cooking mood with my posts! If you decide to cook any of the recipes please let me know how they go!